When I first set out to really work with Andrew, one of the things that I wanted to focus on was his pretend play skills. I thought about what preschools and kindergartens did to encourage children to pretend play and realized that they simply provide materials for children to experiment with and play with usually based on a given theme for the week. I remember our school receiving several kits while I taught kindergarten and my students loved going to the stations that had those kits. There was one in particular that was a paleontologist kit which had a little sand bin with fossils, bones and eggs that you could bury and unearth using toothbrushes, paintbrushes. The children would put on safari type hats, khaki vests and for that short time, they were paleontologists! There were some children who preferred to just play with the dinosaur figures and that was okay. I knew that it would not be that easy or natural for Andrew but thought that there had to be some way to introduce and expose him to this sort of fun thing using a more strategic manner. It happened to be right around his birthday when I was thinking about this so when family members asked what he wanted, I told them that instead of going out and buying another toy he wasn’t going to play with, I asked them to choose a theme, get creative by getting things that reinforced that theme so we could make pretend play more meaningful while making connections. This did not have to cost a lot of money and could not include anything that had an on/off switch. We got so many fabulous things ranging from books to costumes and everyone had so much fun knowing that they were doing something that would help him. The themes I chose were: cook, firefighter, farm, space, dinosaurs, doctor, construction, grocery store, cars. 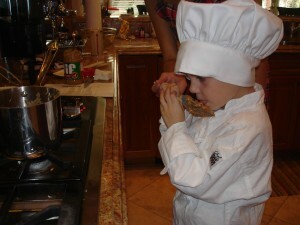 Chef Andrew cooking up some Chex cereal concoction. He was only willing to lick, not eat what we made but that was farther than we had ever gotten with something like that! It was so great and I still have those boxes, adding books or toy figures to them if they go along with the theme. In my mind, working on building pretend play skills has to begin with relating it to one’s own life. This is a bit more challenging when a child is only focused on themselves but having theme boxes at home is a great way to slowly build this awareness in a safe environment. When introducing this with Andrew in My Obstacle Courses, I began by choosing a theme, looked at the contents of the box and picked one thing to introduce. This was as simple as matching up the big dinosaur with the little dinosaur, putting a tool on it’s name card, or pointing to the ladder on a fire truck. This may seem basic, and if it is for your child, make it more in line with what they can do, but I was starting where he was, building the foundation. I would start this way because it is not as intimidating as sitting there with a bunch of stuff that they don’t relate to, cannot name and don’t know the purpose of. They cannot know what they do not know (just like us, huh!) and some children need this kind of play introduced more strategically. I strongly encourage using scripts if your child struggles with “getting” pretend play. It made all the difference in the world for us. It removed lots of unnecessary words from my mouth before the play actually began, which can often overwhelm and confuse him. It made it official, after all, it was printed out on a sheet of paper! It also provided a logical sequence of activity. Ex. Push the blue car up the ramp. Park the blue car in a parking space. Put the red car in the elevator. Make the elevator go down. The red car needs gas. The red car is ready to go! That’s it! Nothing fancy required but it made a huge difference. This gave Andrew a schema for what to do with these items, how to use them and what all of the parts of the garage could do. I did add some pretend play talk and noises while he was moving the cars around to model this for him. While it did not happen overnight, just last night we got to listen to him pretend play with a castle and some people. The queen had gotten “hurt” and he walked two knights over to get her, making them walk across the floor while saying, “Oh no, she’s hurt!” They got her and brought her back to the castle. Some of you may think this is not a big deal and others may feel like they’ll never get there (I was like you!) but I feel that any small step one can take to move toward a goal is a step worth trying and taking.